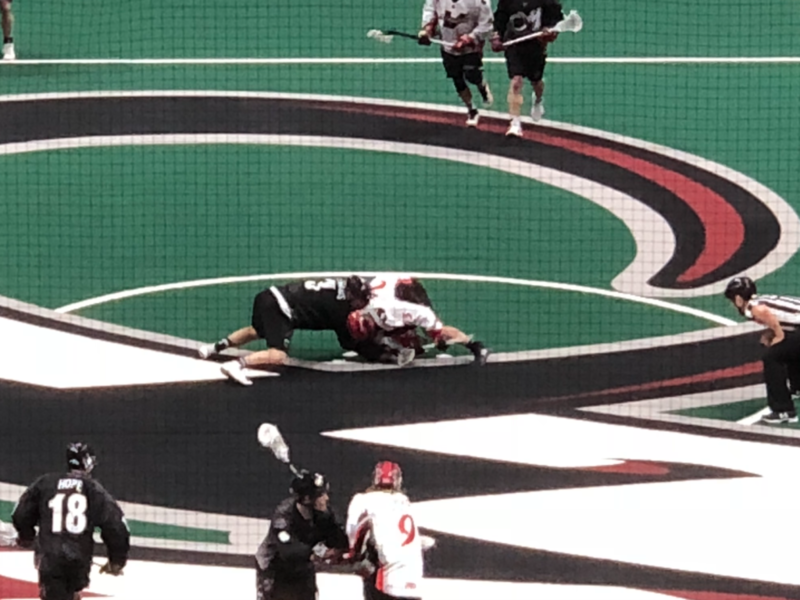 On August 1st of last year, the Colorado Mammoth traded away Callum Crawford and Alex Buque to the Buffalo Bandits and received Ryan Benesch, a prolific left-handed scorer, in return. As with every trade, there were skeptics. Critics wondered if Benesch would prove to provide the spark the Mammoth offense had been looking for. After tonight, it’s safe to say that Benesch silenced the skeptics. The veteran scorer finished the night with four goals and two assists against the Vancouver Stealth. That’s on top of the 25 points he had already accumulated this season. Benesch consistently produces. It’s just that simple. To start the game, the Mammoth came out strong for the second game in a row. Led by Dillon Ward and Joey Cupido, Colorado’s defense held Vancouver off the board for a full thirteen minutes to start off the contest. Tim Edwards and Ryan Benesch both got on the scoreboard and by the end of the first, Colorado held a 2-1 advantage. The score differential truly fails to indicate just how dominate the Mammoth were in the first quarter. The Mammoth were hungry and everything seemed to be going their way to start. However, this season, it seems like we really can’t judge a Mammoth performance until we reach the second quarter. This is where, for various reasons, everything quickly falls apart. For the second straight game, Colorado allowed their opponent to charge back into the contest and take a commanding lead. Corey Small recorded a hat trick and Brandon Goodwin added an additional two goals in the second period as the Stealth outscored the Mammoth 6-3 in the second. Heading into halftime, Colorado trailed the visitors 7-5. While Vancouver got on the scoreboard first in the third quarter, Colorado went on a three-goal run to tie the game midway through the period. Thanks to four different scorers and five different Stealth penalties, the Mammoth found themselves trailing Vancouver by only one goal heading into the final period. Lee and McLaughlin got the scoring started and gave the Mammoth their first lead since the beginning of the second. The rest of the quarter would see three different lead changes before entering the final 90 seconds of play. Down 12-13, the Mammoth needed someone to step up. Jeremy Noble answered the call. Noble tied the game at 13 goals apiece with 1:24 left in the contest. Then, the University of Denver grad notched his third goal of the game with 31 seconds remaining to give the Mammoth a one-goal lead. After thirty seconds of killing time, Colorado walked out victorious by the skin of their teeth. Overall, there were more positives than negatives for Colorado in today’s game. The Mammoth went 5-for-9 on the power play tonight, which is much improved from their previous results in that category. Another thing to be proud of would be Colorado’s tremendous ball movement. When it was all said and done, the Mammoth had eight different players get on the score-sheet today. As for the negatives, the only worry would have to be their shot count. The team averaged 71 shots heading into today’s game and they certainly did nothing to lower that number tonight. The coaching staff stressed the importance of quality over quantity this week, but the message didn’t seem to fully resonate with the players. Reckless shots caused unnecessary turnovers, something that luckily did not come to haunt them. Colorado’s record improved to 4-1 with tonight’s victory. The Mammoth will be back in action next week Friday when they host the Saskatchewan Rush at the Pepsi Center.